To understand how to treat your heat-damaged hair, you need to understand the biology of hair. First off, hair is dead. You cannot repair something that isn't living. 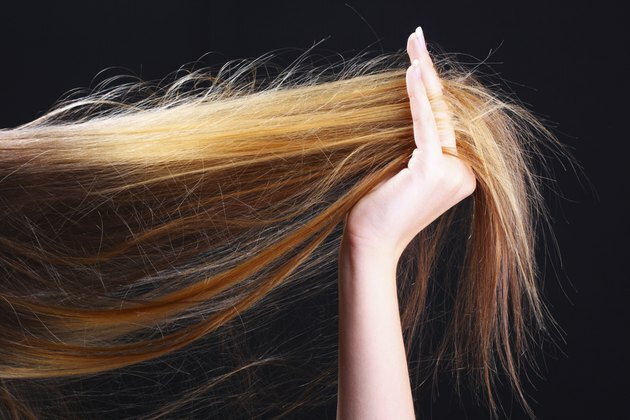 Hair is made up of the same protein as our fingernails -- keratin. Just as a fingernail can chip and crack, hair can easily be damaged. Heat damage to hair is typically caused by blow dryers, curling and flat irons, UV rays from the sun and chemicals in relaxers and perms. Heat damages the hair by removing water and moisture from the hair shaft. Especially destructive, says a study published in the "Journal of Cosmetic Science," is applying extreme heat, like a curling or flat iron, to damp, wet hair. The iron literally boils the moisture in the hair, causing the cuticle to bubble and buckle. Dry hair also sustains damage from heat sources, but to a lesser degree. The hair weakens and can break and become brittle. Thermal protector products coat the hair follicle with polymers that shield hair from heat damage. Shampooing your tresses less often can actually prevent damage. Most shampoos are composed of about 10 to 15 percent detergent, which cleans hair and removes oils, stripping your hair of heat protection. Washing your hair with shampoo about two or three times a week is generally sufficient. Conditioners also contain some detergents, though different types than shampoo. So if you forgo shampooing most days and choose to just condition, you're still cleaning your hair without drying it out as much. Silicone seals the hair cuticle and allows the hair to resist damage better than untreated hair. It also protects hair from becoming brittle and breaking. Silicone hair products help the follicles retain moisture and prevent frizzing and drying. Use conditioners, which penetrate into the hair. This means when you use a conditioner prior to heat exposure, you're actually increasing the strength of the hair. The Beauty Brains scientists recommend a leave-in conditioner. Despite what cosmetic companies would like you to believe, there is no way to repair split ends without cutting them off. Products that claim to fix split ends essentially coat the hair with a protective film, which washes away the next time you shampoo. So to fix your split ends, you'll need to trim your hair. But to prevent split ends, condition your hair after you shampoo, and deep condition once a month. Society of Cosmetic Chemists: Effects of Thermal Treatments . . . The Beauty Brains: Can Any Product Really Repair Split Ends? The Beauty Brains: Is the No-Poo Method for You?